The Ministry of Municipality and Environment (MME) signed agreements with a number of national companies to implement projects in the field of agriculture, fisheries and livestock for owners of Qatari farms. A contract for the operation of a fish farming project was signed between the MME and the Gulf Engineering & Industrial Consultancy. The contract was signed by Director of Fish Wealth Department at the MME Abdulaziz al-Dehaimi, and general manager of the company Dr. Ali al-Marri. Al-Dehaimi said that the project aims at carrying out experiments on the economic feasibility of local marine life, including experimentation and application of modern high-efficiency fish farming systems, supporting fish stocks, training national cadres and building capacities in this field, in addition to contributing to increasing local fish production and food security through the provision of quantities of baby fish, and registering the part of fish farming at Water Research Center at Ras Matbakh in Al Khor. He pointed out that the total value of the project is about QR57.2mn for 3 years, while the production capacity of the project is 2mn small fish. For his part, Dr. al-Marri praised MME’s granting of the company an opportunity to manage and operate the project, adding the company’s experience in the design stages and implementation of the project will bring the desired results. 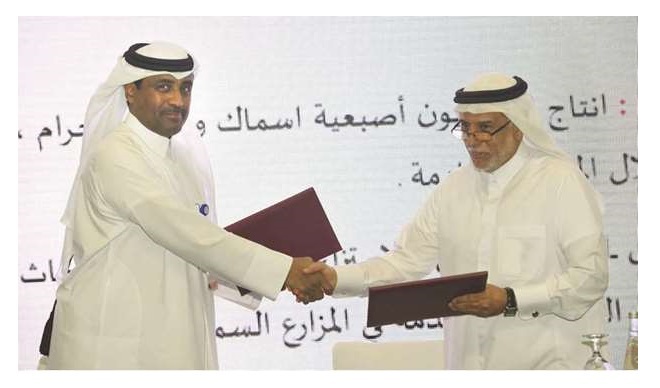 The ministry also signed a contract with a local company for animal feed, about which Abdulaziz said this feed project is aimed at small farmers. The MME signed contracts for the supply and installation of cooled and standard greenhouses with hydroponic system for farm owners. It signed the contracts with two national companies specialized in agricultural investments and greenhouses. Director of the Agricultural Affairs Department at the MME Yousuf al-Khulaifi said that the signed agreements with the two companies would help the owners of the farms, noting that the number of greenhouses of various types covered by the contracts is 3,500 established on 110 hectares. Their production will be 10,000 tons of vegetables annually and will contribute to the increase of domestic production by 15%. He noted that the MME’s plan aims to reach 70% of self-sufficiency of vegetables by 2023.